❤ I found these Label’s on Martha Stewart.com for free. You just download them, print them out, cut them out and glue or tape them onto your item. In this picture I used an old jar (remember to save all your jars they come in handy) and filled it with homemade Salsa. ❤ This is a Mini Wine Bottle, they come in a four-pack, you could also use a Soda bottle. I saw them place it on a Tabasco Bottle and it looked really cool. 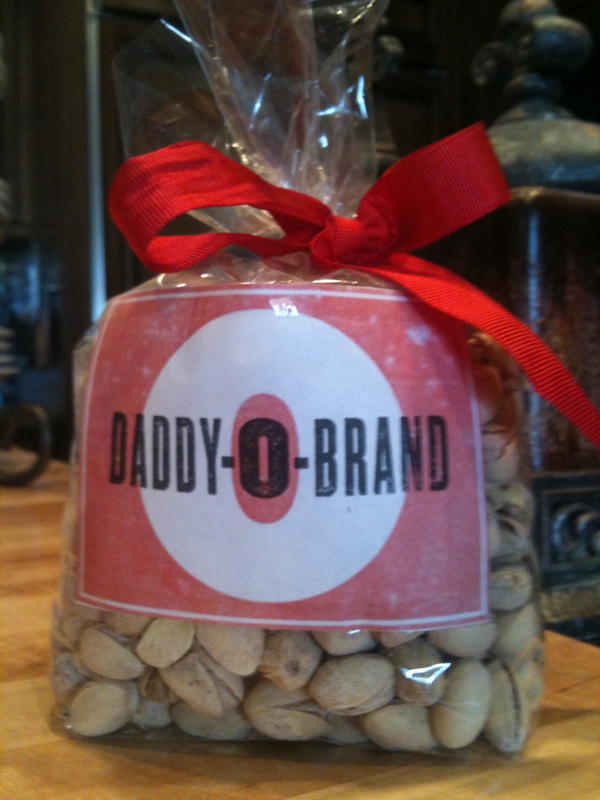 ❤ The Daddy-O-Brand label is really retro looking to me. I took a clear bag that I purchased @ Wal-Mart, filled it with pistachio’s and tied it with a Red Ribbon ( a Black Ribbon would look coolio also). 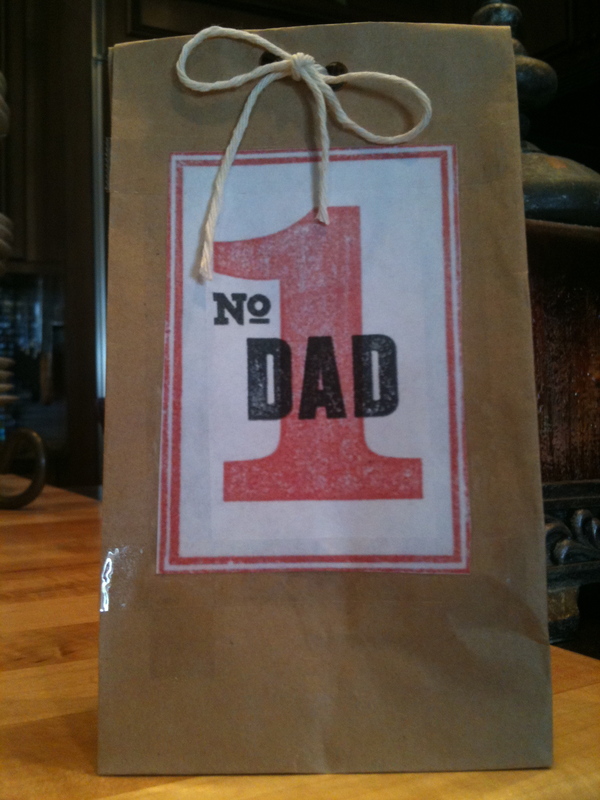 ❤ Here I took a mini brown bag that I purchased @ Michael’s, taped the “#1 Dad tag” on it, filled it with some black licorice bites, folded over the top, punched two holes at the top and used twine to make the bow. Ta Da how easy is that. 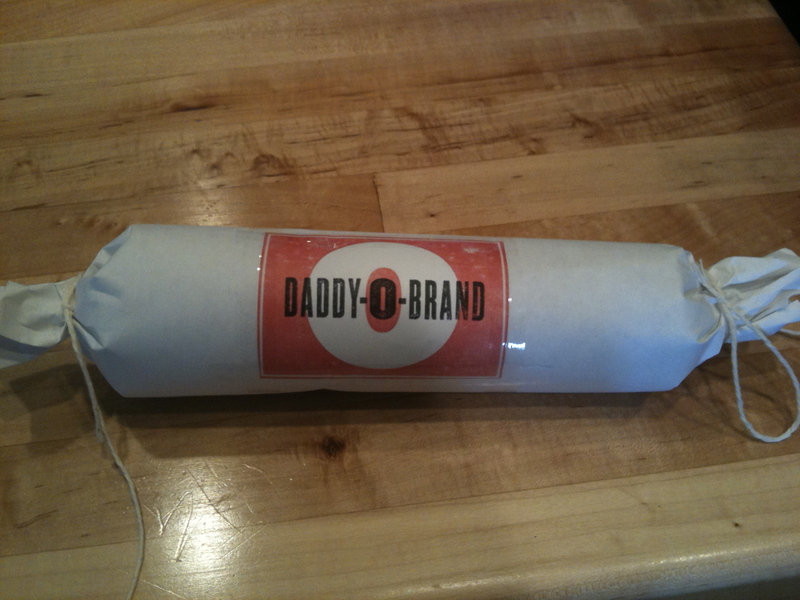 ❤ One of my Dads favorites is Salami, so I took the Chub and wrapped it in white butcher paper, tied the ends with twine and taped the Label on it,its gonna go good with that Vino! All these Gift’s were so easy and fun. 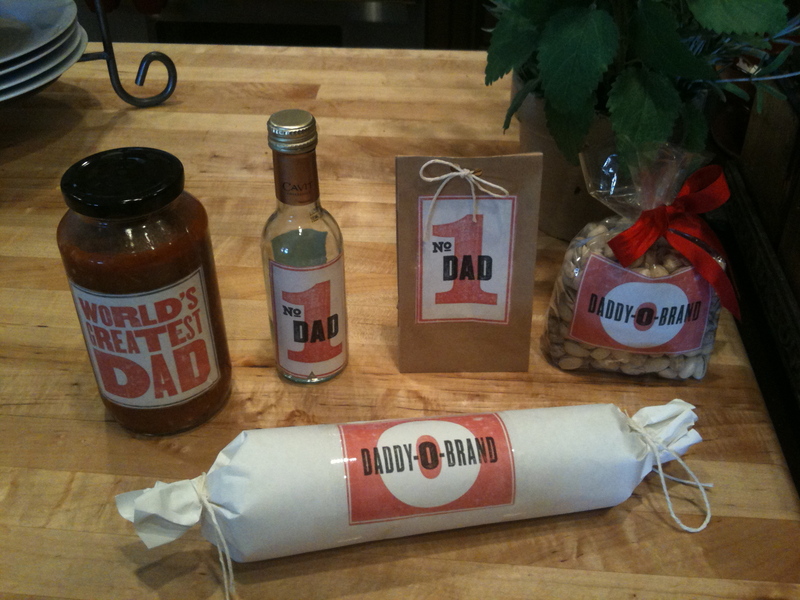 I enjoyed finding the cool containers to hold some of my Father’s favorite goodies. One item I was going to use but did not was a Chinese Take Out Box…That would of been cute. If you come up with any idea’s for your Pop’s, Husband or Son in your life share with us, it would be fun to see what everyone comes up with. 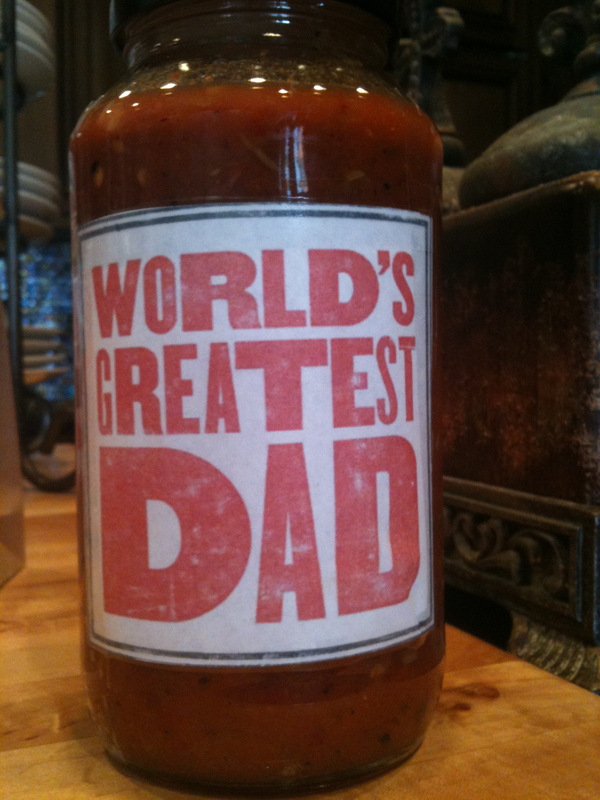 Happy Father’s Day to all the Father’s out there, We Love You! Next: Next post: Knock-Knock, Who’s There? Orange! Cool. You are so clever. Love you. 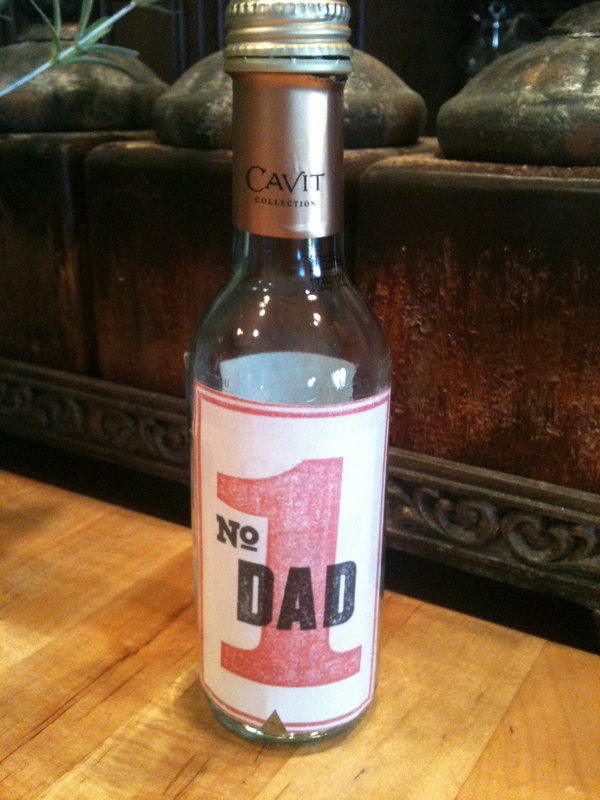 Do you think the Father’s Day labels will stick to a corona bottle??? hahahaha!